Lana Del Rey is both sculpted by pain and feels creatively defined by it. Her recent feud with the Guardian, however, reveals that she is not entirely lost. To my left, a young woman in denim shorts and a headdress punches a middle-aged man in the face. They argue about the definition of respect before she hits him again. At this point, some frat guys get between them and break up the fight. The young woman in the headdress keeps on saying how she needs to get to the front of the crowd at Coachella 2014 or she’ll die. To my right, a girl with braces pulls out her cell phone and Facetimes her friend—who is dressed in pink sweats and a hoody repping some LA-area middle school—and together they cry. Lana Del Rey isn’t even on stage yet. It’s easy to dismiss this level of intensity as regular teenage enthusiasm amplified by the Indio, California sun, but it’s hard to image anyone getting repeatedly punched while waiting to see Miley Cyrus, Taylor Swift, or Lorde. Yes, these pop stars inspire fan mania, but it’s the type of enthusiasm that prompts radio sing-a-longs and obnoxious picture taking at concerts. And this contrast between typical pop fandom and what Del Rey’s fans exhibit—the pushing, the uttering of phrases like “I just need to be close to Lana”, the violence—makes the latter seem like an abnormality. But, in fact, their behavior is by design. Del Rey has not always been a self-described “gangsta Nancy Sinatra”. She was born Elizabeth Grant and grew up in Lake Placid before moving to Connecticut at the age of 14 to attend boarding school and, in her own words, to “get sober”. 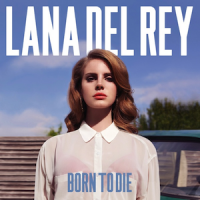 In 2012, Elizabeth Grant, operating under the stage name of Lana Del Rey, released her first album, Born to Die. Since that album, Elizabeth Grant hasn’t existed. In every song, interview, and public appearance, she’s Lana, the beautiful young woman who’s haunted by loneliness, isolation, and depression. Lana is the type of person who says, “There’s always been a melancholy in me, call it desire.” She writes songs entitled “Pretty When You Cry” and “Summertime Sadness”. She’s a tragic figure and not much else, a character who prohibits both the press and her own fans from seeing her as anything other than a combination of Marilyn Monroe, Connie Parker, and Amy Winehouse. This kind of pop-star method acting, however, is how Del Rey inspires such mania in her fans and sustains interest from both music journalists and the public-at-large. By re-imagining her life as a blown-out Hollywood production about someone who really wants to join the 27 Club, Del Rey acknowledges the world’s fascination with tragic woman and invites them to watch a new train wreck. The result? Born to Die has sold seven million copies worldwide. Even her music videos, a medium no one has really cared about since the members of OK Go filmed themselves dancing on treadmills, are 100 percent Lana. In the video for “National Anthem”, Del Rey plays both Marilyn Monroe and Jackie O to A$AP Rocky’s JFK. While Lana’s character doesn’t die in the video, Rocky’s unsurprisingly does. Post-assassination, Del Rey tries to look shocked, saddened, suddenly abandoned, but she doesn’t quite get there. Instead, she stares off-screen, looking confused and slightly angry, as though someone has taken the last bagel from craft services. For Lana, the acting is secondary. Instead, the function of the video is to draw people into her world, to get her fans to view her in the same way that the general public views Marilyn Monroe and Jackie O, to get journalists and bloggers to write think piece after think piece about the character of Lana Del Rey and what she means in regard to authenticity in popular music. In responding to the Guardian piece, Del Rey is forced to wade through the inherent contradictions of her character. She’s not mad at Jonze because he made up the quote or even took it out of context. Instead, she’s mad because Jonze questioned her mystique, drew attention to the fact that Lana Del Rey is indeed a character, a calculated construction concerned with concepts such as the public’s interest in fame and young death. And if her tweet is anything to go by, Del Rey finds being calculated a negative character trait—that is, unless she’s the one doing it. In her criticism of the Guardian article, Del Rey writes, “Alexis [Petridis, writer] was masked as a fan.” Aside from the fact that Del Rey got the interviewer’s name wrong (she was interviewed by Jonze, not Petridis), her tweets also illustrate exactly what Lana wants: for her life to be a movie, a reality where everyone takes her performance at face value. None of the extras in Some Like It Hot turned to the camera and reminded the audience that Marilyn Monroe was playing a character. But the character of Lana Del Rey would never admit to not finding a young death glamorous. She named her first album Born to Die, and in the video for the album’s title track, she dies in a fiery car crash while making out with a cracked out Cillian Murphy look-a-like. Instead, this tweet could be the first anyone has seen of Elizabeth Grant in years, finally emerging to publicly distance herself from an aspect of Lana that, when criticized by someone who lost her father to an early death, can’t help but seem a little distasteful and self-serving. Near the start of her set at Coachella, Del Rey climbs off stage and gives security a near-heart attack by leaning into the crowd. Cell phones emerge as everyone battles to get a photo of the pop star, an opportunity for proof, a chance to say, “Yes, I was there, right before she imploded.” But amidst the chaos, Del Rey smiles. The crowd may think she’s a time bomb, or as one man on the shuttle to Coachella called her, “Lana Del Mess”; but maybe, for the first time in her life, she’s enjoying herself. However, when Jonze posed the same question, Del Rey’s answer was a straight “No." Madonna could only be Breathless Mahoney for so long, just as David Bowie could not remain Ziggy Stardust in perpetuity. In contrast, Grant seems wholly committed to the character of Lana, claiming she has nothing left to say, all the while making music, giving interviews, and touring the world. Given this continued commitment to the character of Lana, maybe Grant is afraid to move on, nervous to shed the persona that allowed her to achieve both critical and commercial success. But if that’s the case—that Del Rey is both sculpted by pain and feels creatively defined by it—it puts her work in a depressing context, illustrating that if mainstream female pop stars don’t want to wear cupcake bras or ride massive hot dogs, tragedy, depression, and death may be their only creative options. Jonathan Crossley is a graduate of Loyola Marymount University and is currently pursuing an MST in Creative Writing at the University of Oxford. He is too tall to be an astronaut.